Above and left: Saguaro National Park, East, February 22, 2015. 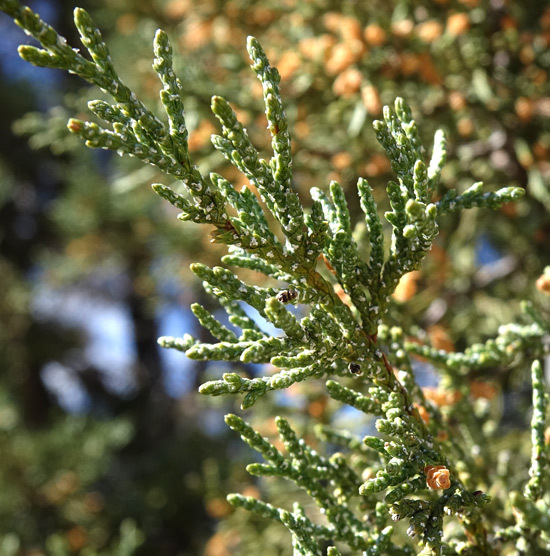 This very distinctive and attractive Juniper is found only in the far southern portions of the Four Corners area in Arizona and New Mexico. 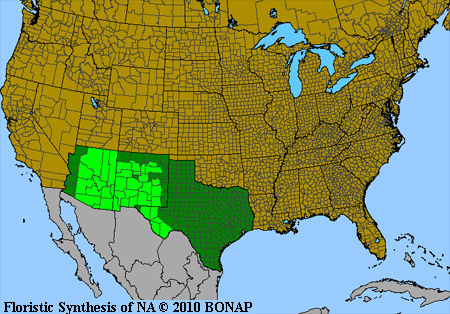 (It ranges southward through Arizona and New Mexico to West Texas and into Mexico.) 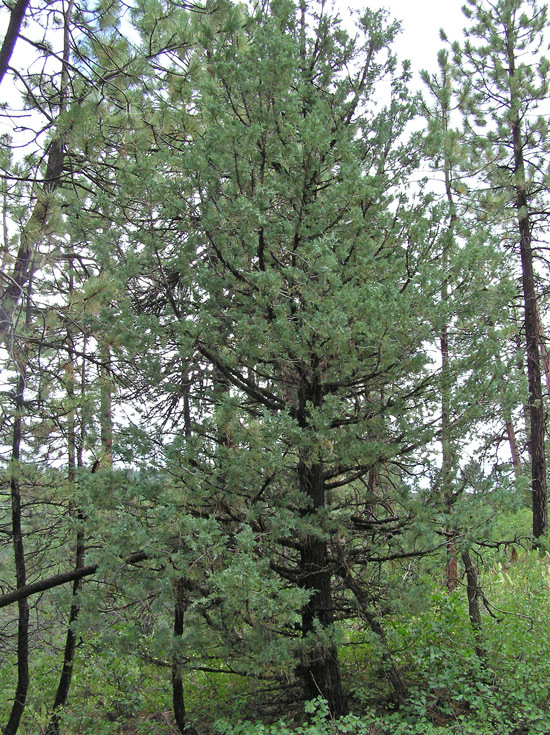 It is often scattered among Ponderosa Pines, Pinyons, other Junipers, and Oaks. Its berries are a good food source for many birds and mammals, including Turkey, Coyote, and mice. El Moro National Monument, New Mexico, May 21, 2003. 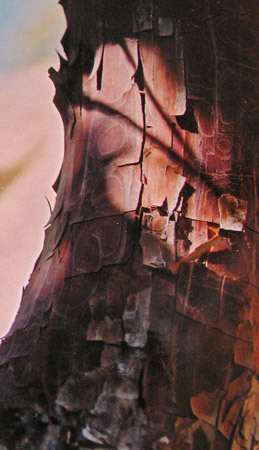 Beautiful burnt orange bark, still plated in Alligator squares, often appears on the young limbs of old trees. Semi-desert, foothills, montane. Woodlands. Spring. 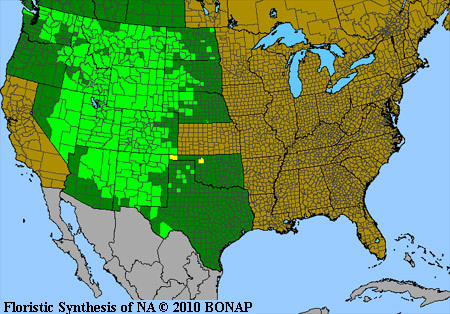 In the Four Corners area, Rocky Mountain Juniper is not as common as Utah Juniper, although it does occur in large stands in some areas. Rocky Mountain Juniper becomes the dominant Juniper in its preferred habitat of cooler, more moist, and higher elevations than Utah Juniper. 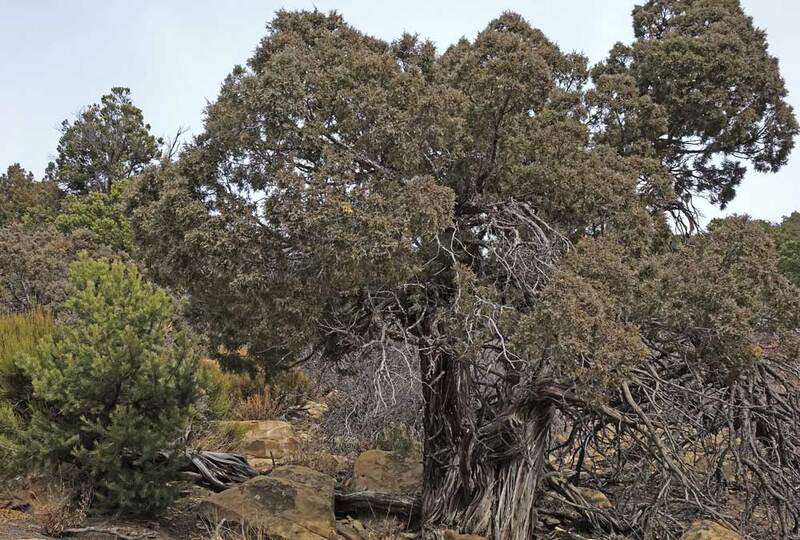 Rocky Mountain Juniper is often found on north facing slopes in association with Ponderosa Pine. 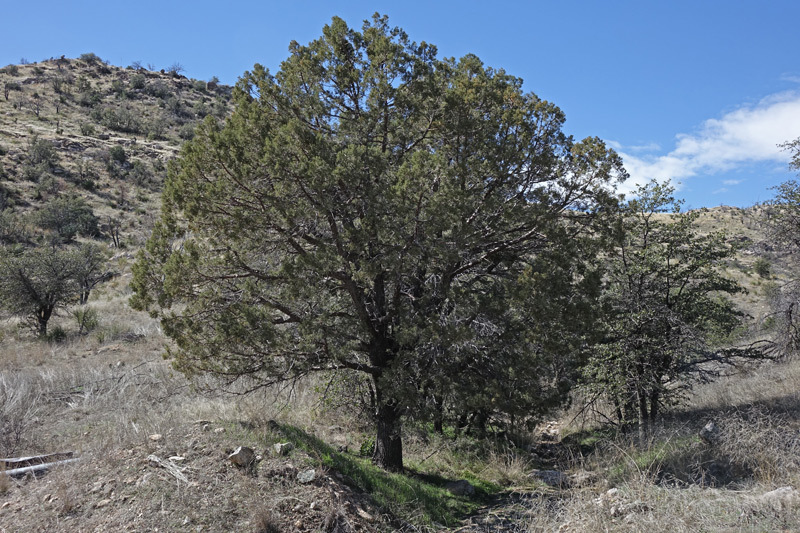 The photograph at left shows such a location and also shows the open branching pattern and tall, narrow form of a Rocky Mountain Juniper when crowded by other trees. The photograph above shows the very typical low, dense growth pattern when the tree grows in uncrowded open meadows, its preferred habitat. 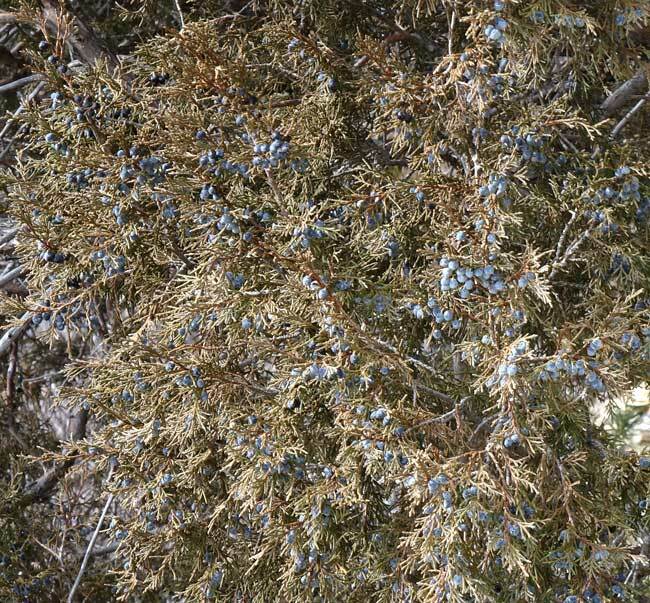 Rocky Mountain Juniper can be distinguished from Utah Juniper by its flatter, more slender, lighter blue-green to yellow-green leaf clusters; its more upright and symmetrical appearance; its bark which seldomly shreds and flakes; and its (usually) single, central trunk. With a powerful hand lens or microscope you can see another characteristic which some floras (including the Flora of North America) indicate distinguish the two species: margins of the very tiny leaves of J. scopulorum are entire, those of J. osteosperma are minutely denticulate. Unfortunately other floras say that both species have denticulate margins. Examine many specimens yourself and see what conclusion you come up with. Let me know. 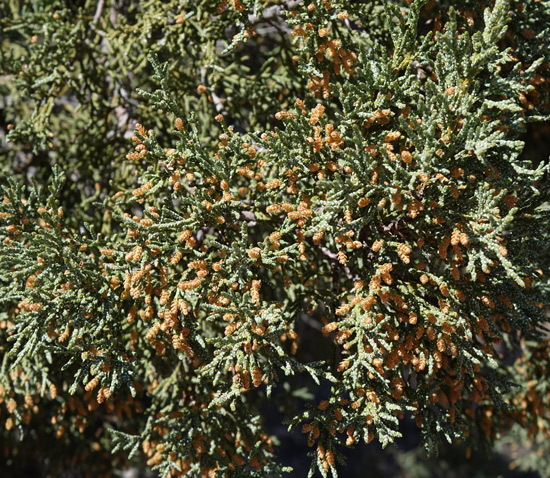 Juniperus scopulorum is, in contrast to Juniperus osteosperma, almost always dioecious, i.e., it has male flowers on one tree, female flowers (and thus the fruit) on another. "Scopulorum" is Latin for "of rocky places". 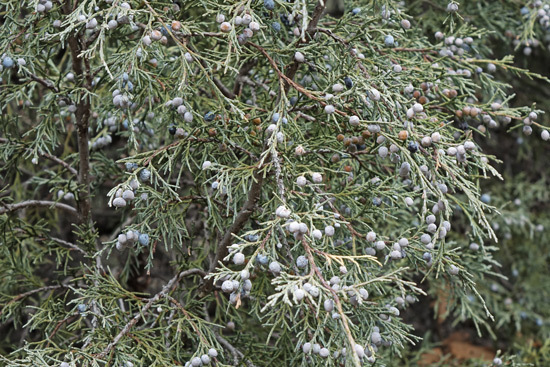 The most often used genus name for this plant, Juniperus, was given by Linnaeus in 1753. The Sabina scopulorum name was given by Per Axel Rydberg in 1905. This species was first collected in Yellowstone National Park in the 1890s and was named Juniperus scopulorum by Charles Sargent in 1897. 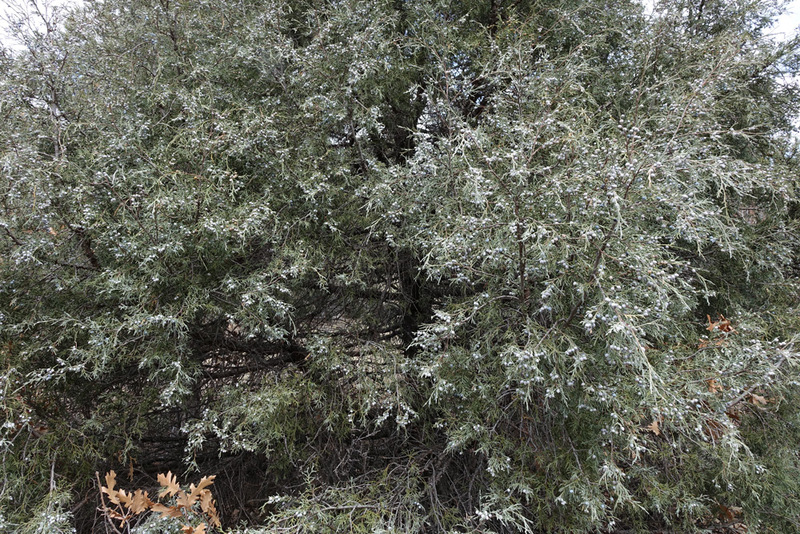 As the top photograph at left shows, clusters of leaves of Juniperus scopulorum are thin and flatted. See especially the side view of a leaf cluster that the arrow points to. 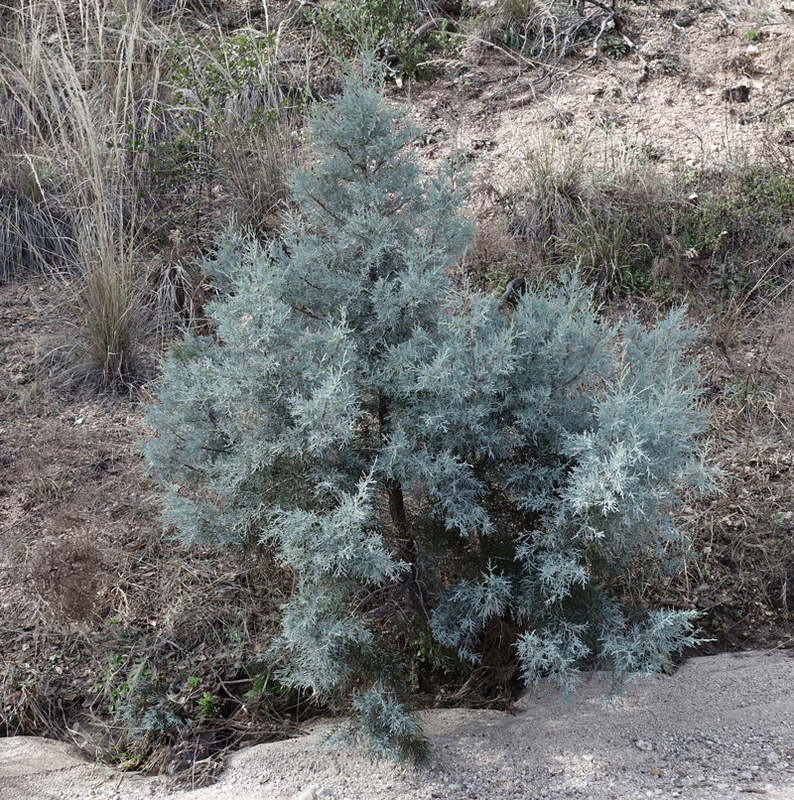 Clusters of leaves of Juniperus osteosperma are much broader and rounded. Also, note, as mentioned above, the blue-green cast to the leaves. Juniperus scopulorum berries are smaller than those of Juniperus osteosperma and are juicy, not dry and mealy. 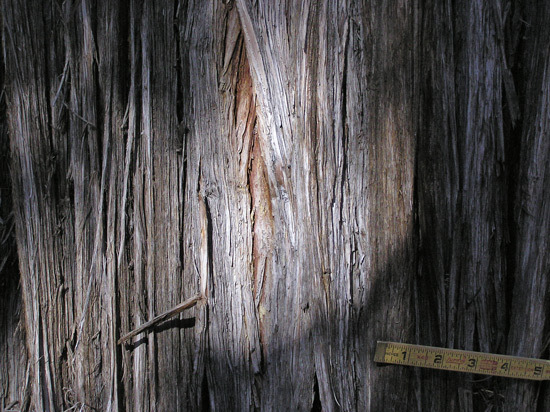 Juniperus scopulorum bark is light gray, fairly tight, and it does not shred anywhere near as much as Juniperus osteosperma bark does. 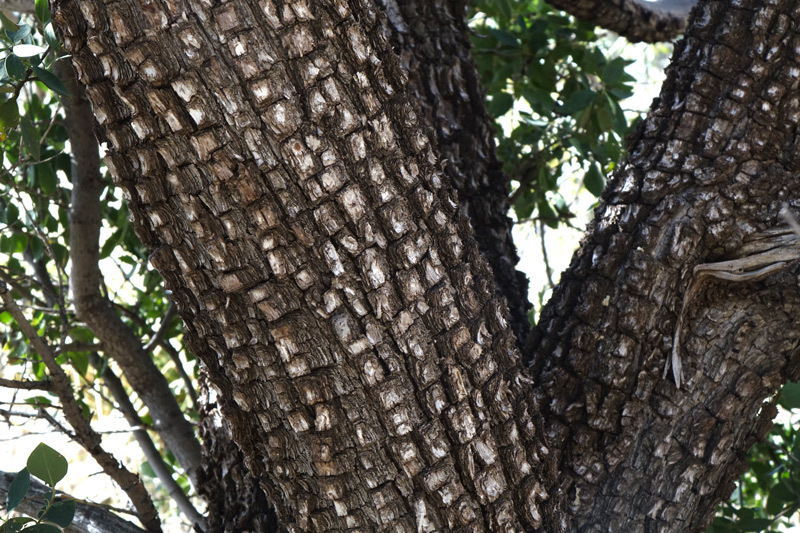 The bark shown is on a tree two feet in diameter and quite old. Point Lookout Trail, Mesa Verde National Park, November 30, 2017. 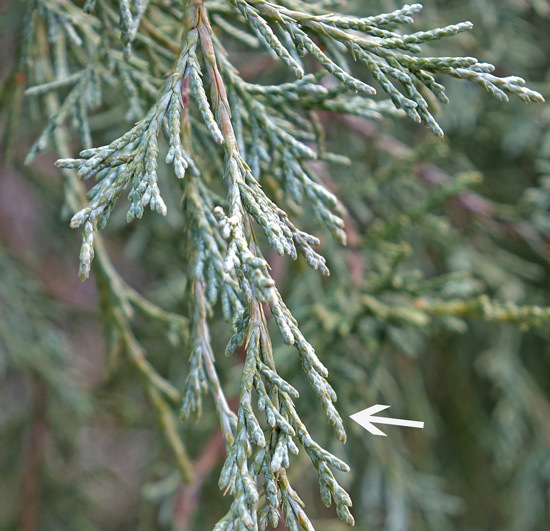 Although many conifers retain chloroplasts and green color through the winter, Juniperus scopulorum loses chloroplasts and leaves fade to a dull gray-green. In the photograph above, you can see the contrast in color between the Pinus edulis at lower left and the large Juniperus scopulorum.